How prepared are you for human enhanced natural events? Foreign aid workers estimate that about 3 million people severely affected and were made homeless. According to a study, up to 3.2 million Burmese lost their homes as a result of Nargis. Death toll: At least 69,185 people were killed. No injuries: 374,171 people were injured. Other: 18,467 missing and presumed dead in the Chengdu-Lixian-Guangyuan area. More than 45.5 million people in 10 provinces and regions were affected. At least 15 million people were evacuated from their homes. More than 5 million were left homeless. An estimated 5.36 million buildings collapsed. More than 21 million buildings were damaged in Sichuan and in parts of Chongqing, Gansu, Hubei, Shaanxi and Yunnan. As one of the coldest winters on record looms over Sichuan, more than 1 million families displaced by the May 12 earthquake are still without proper homes, a senior provincial official said on Friday. China Daily. 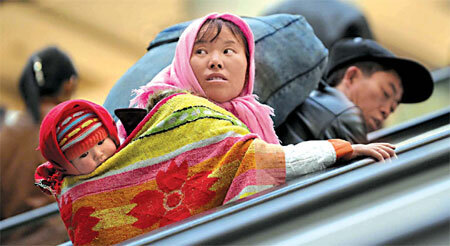 A home-bound migrant worker from Sichuan carries her child in a railway station in Shenyang, Liaoning province on Friday, after failing to find a job in the city. Many people displaced by the May 12 earthquake have left their hometowns in search of work. [Agencies] Image may be subject to copyright.